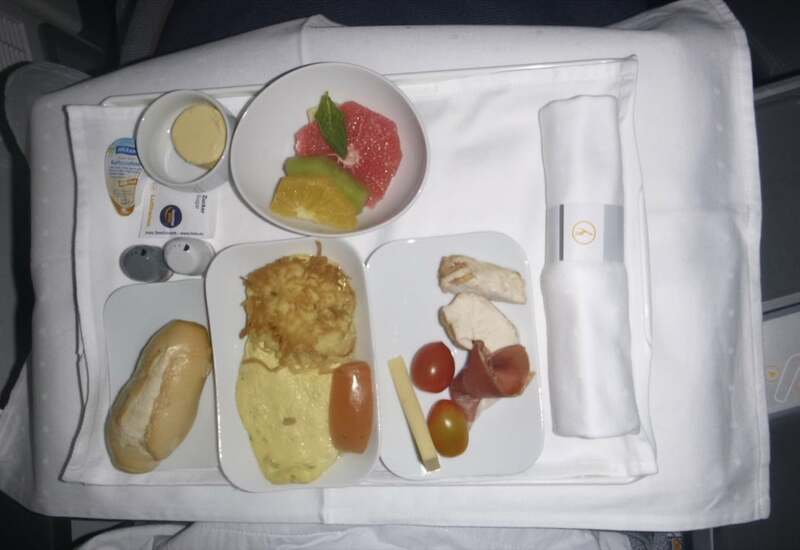 In this trip report I review my flight on Lufthansa B747-8 in Business Class from Buenos Aires to Frankfurt.This was the homeward bound flight at the end of an extensive tour of South America. 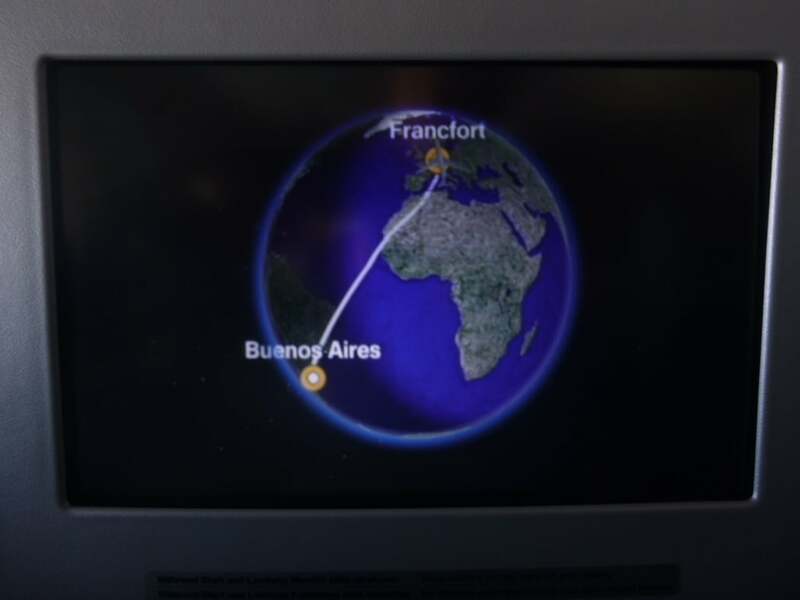 We had flown around the continent for five weeks with LATAM, Avianca and Aerolineas Argentinas. So, flying with a major European carrier just underlined that we were on our way back. We had been very impressed with LATAM, a bit less so with Avianca (especially their unreliability) and decidedly not with the Argentinian flag carrier. We had allowed two hours for check-in and, as it turned out to be pretty speedy for business class, we had time to sample the lounge. The Star Alliance lounge at Buenos Aires Ezeiza Airport (EZE) allows entry for Priority Pass holders and it was nothing special as you might expect. Nonetheless, there was plenty of seating and some fresh food and complimentary drinks. We weren’t bothered as we intended to eat dinner on board with an early evening departure (17:15). We also wanted to board as early as possible to get some pictures of the cabin, so we didn’t stay too long before heading to the gate. We managed to board about 45 minutes before push-back and were first into the top deck cabin. 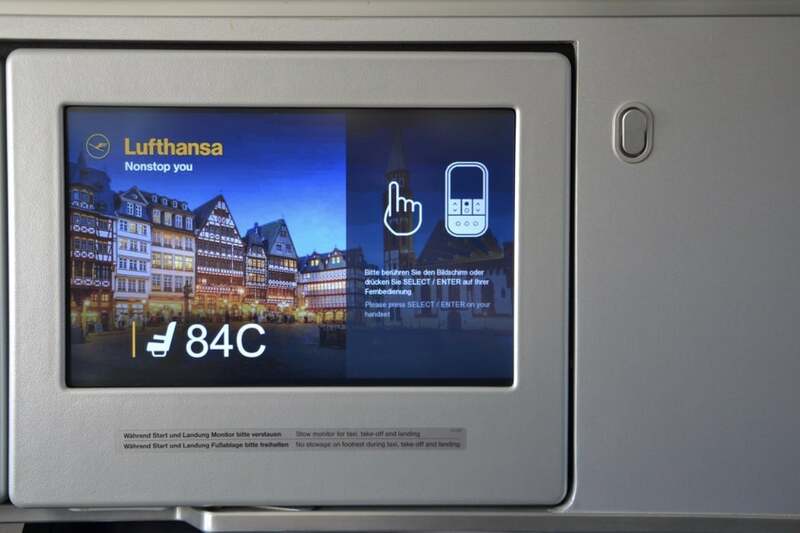 Lufthansa fly the doughty old Jumbo on this route in the newest and biggest 800 configuration. 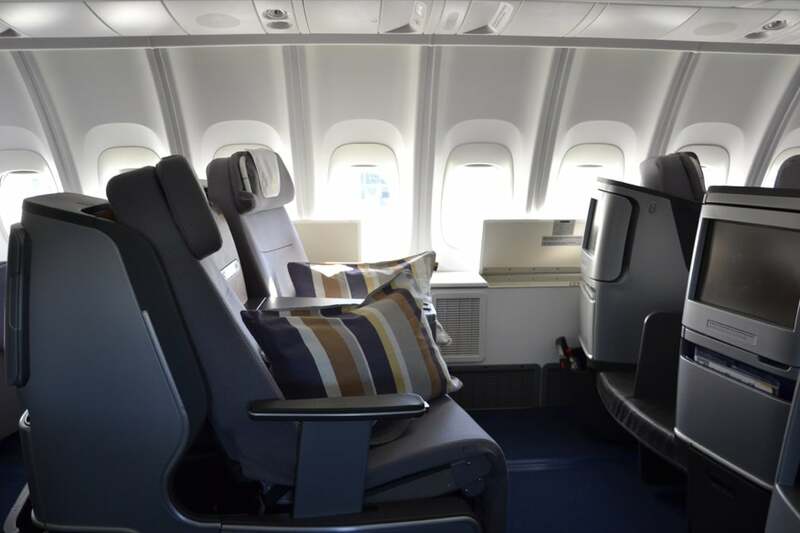 On the 747-800, Lufthansa use the entire upper deck as a Business Class cabin. Somehow having that staircase always makes flying upstairs feel more exclusive. 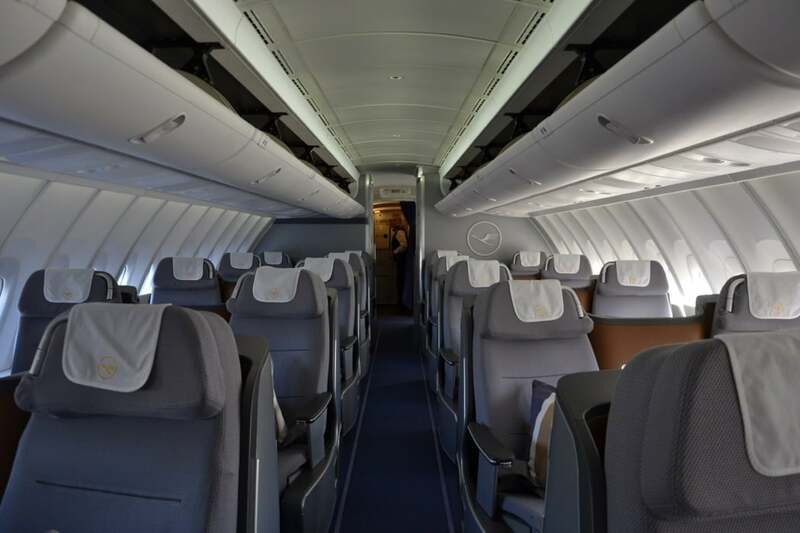 There are only eight rows of four seats in this cabin, in pairs on either side of the central aisle with each seat angled towards it’s neighbour. The ambience is cool and muted in the overall effect with white ceiling and walls and mid grey upholstery. Nonetheless those fabrics do feel good quality and the cabin was as sparkly clean as the FA uniforms. 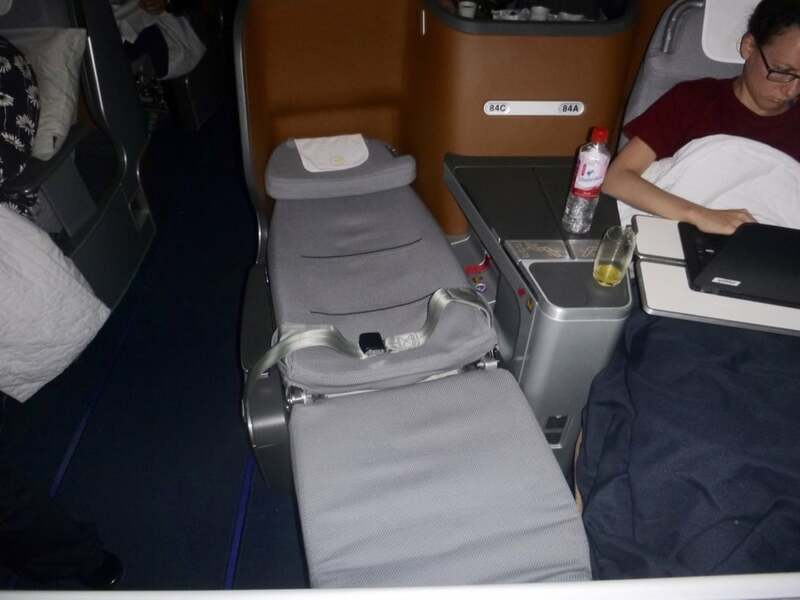 For a thirteen and a quarter hour flight, a lie-flat bed is an absolute must if you want to arrive fit for work rather than a visit to the chiropractor. 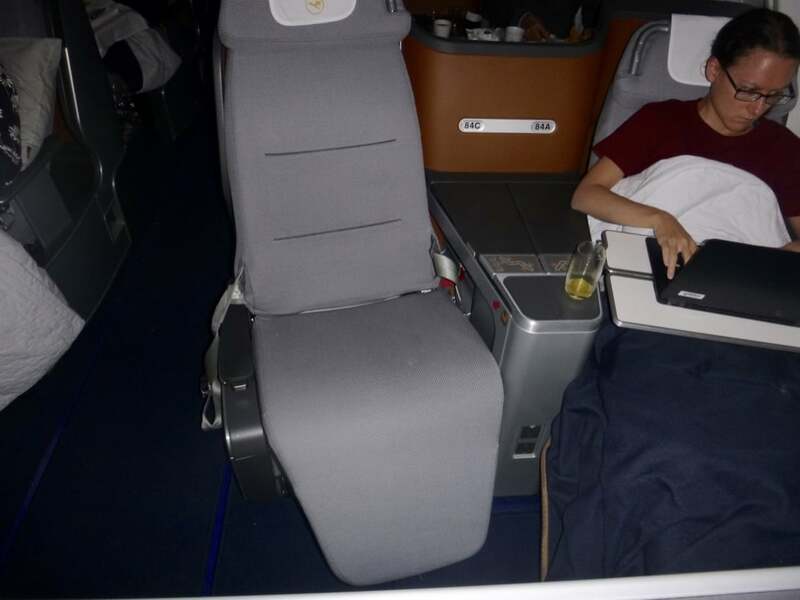 The seats in LH business class do indeed lie fully horizontal. 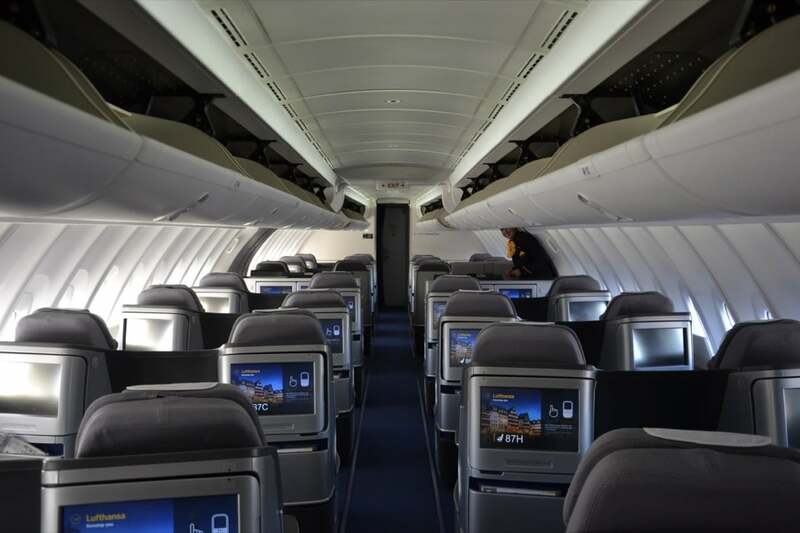 They are not the widest seats in the sky though by any means (20″ wide 78″ long). I mentioned that the seats are in pairs angled towards each other at the foot end of the pitch. This creates an interesting situation with your legs straight out in lie-flat or reclined mode as it puts your knees and feet very close to your neighbour’s so you can end up playing footsie (deliberately or otherwise). During pre-flight, the crew were friendly and efficient. There was pre-flight champagne, wine or other beverages available accompanied by warmed almonds. The amenity kits were handed out to each passenger individually but if you’re a seasoned traveller you won’t be excited by this kit. 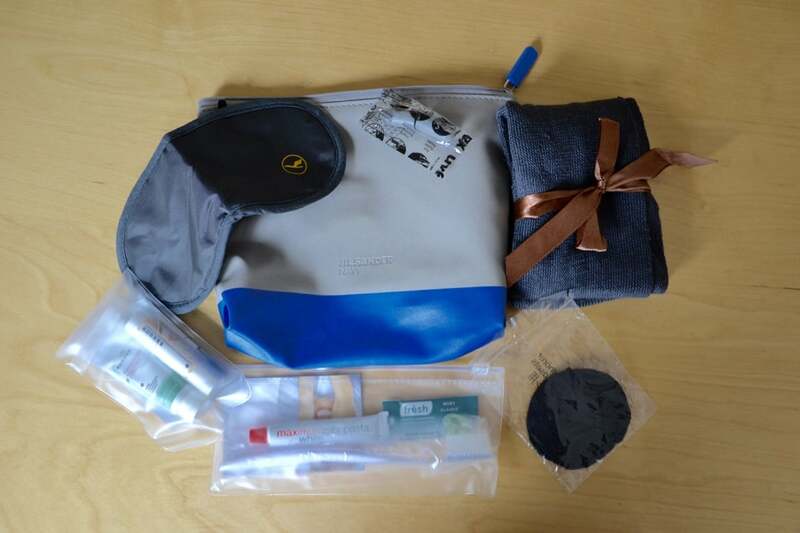 A plastic Jil Sander zip bag containing the usual eye shades, ear plugs, dental kit, socks, covers for your headphone earpieces and a reasonable quality Korres moisturiser. Once we were at cruising altitude the crew snapped into action with the evening service. After refreshing our drinks, the food orders were taken. 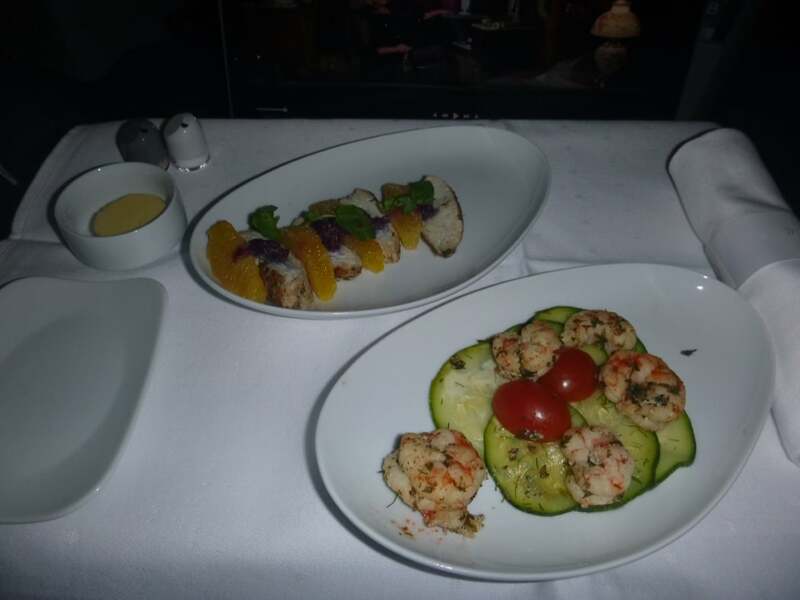 The starters we chose were herb marinated shrimp on a bed of zucchini, with lemon, olive oil and pesto sauce, and marinated chicken slices with orange segments and a red fruit jus. Both were served cold and were of good enough quality and decent size. There was a tenderloin on the menu which looked really good but as I’m allergic to beef and dairy products I had to skip it. 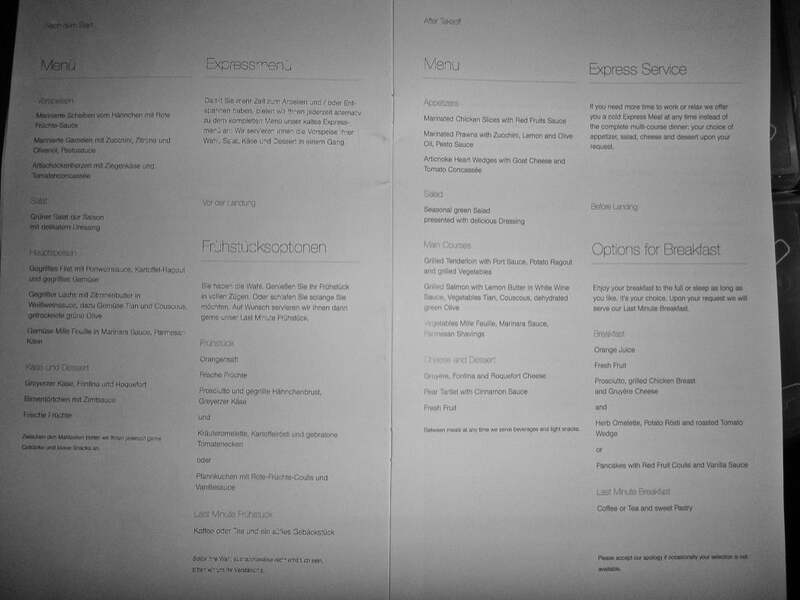 I had attempted to pre-order a special meal on the website but it wasn’t working the day I tried and we were travelling so much, I clean forgot. 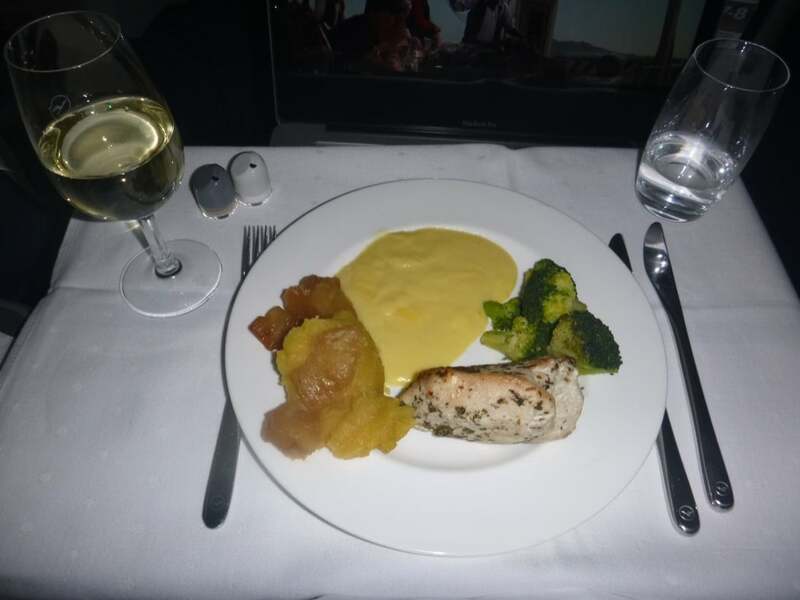 After a mild ticking-off from the cabin manager, the crew came up trumps for me by “stealing” a chicken meal from the First Class cabin. So, I had a very tender marinated chicken breast with some polenta and broccoli. Pretty good in the circumstances. After a few glasses of the excellent Errazuriz Max Reserva 2015 Sauvignon Blanc, I was ready to kick back. The seat is easy to use although once it is reclined, it can be a bit fiddly to reach the controller for IFE and so on. The screen is on the small size for these days (about 12″). There was a good choice of movies but I’d brought my laptop with some pre-loaded entertainment and the retina screen on my MacBook is way superior to the IFE screen. The night passed by reasonably peacefully though the noise levels on the top deck of a 747 are noticeably higher than the Dreamliner which now sets the standard. Since we were travelling as a couple, the fact the occupant of the window seat has to climb over their neighbour to access the aisle was a minor inconvenience. If your neighbour is a total stranger though, it could feel very awkward. When travelling solo, make sure you book an aisle seat. 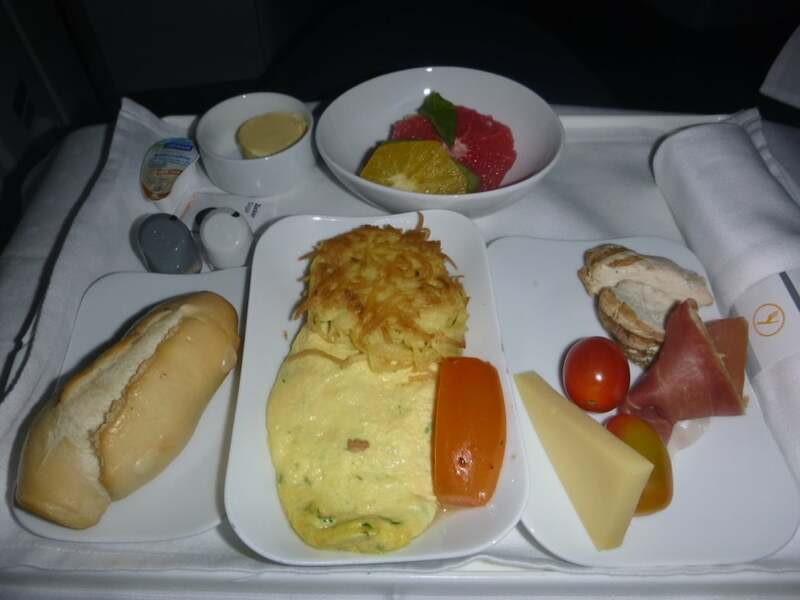 My wife had asked to be woken for breakfast and was delivered a very good omelette accompanied by a small rösti, tomato, a little Prosciutto, cheese and a bread roll plus sliced orange and grapefruit. I settled for fruit juice and coffee. Pancakes and pastries were also available. Our flight departed a few minutes behind schedule but the Captain assured us we’d make up time and in fact LH 511 arrives on time 96% of the time according to FlightStats. We arrived in Frankfurt on time and had no problem transferring to our connecting flight though Frankfurt is a bewildering airport. Overall, the experience was good but not great. In particular, if you are a single traveller, the proximity to your neighbour may feel intrusive and there are no seats available except in a pair or trio. However, on routes from Europe to South America there is little choice in terms of real premium carriers and from Buenos Aires even less so. Sao Paulo is the main hub airport in the continent so from Buenos Aires you have BA, Air France, Alitalia, Aerolineas Argentinas, Iberia and KLM. Sadly, Singapore recently pulled their Barcelona to Sao Paulo route. 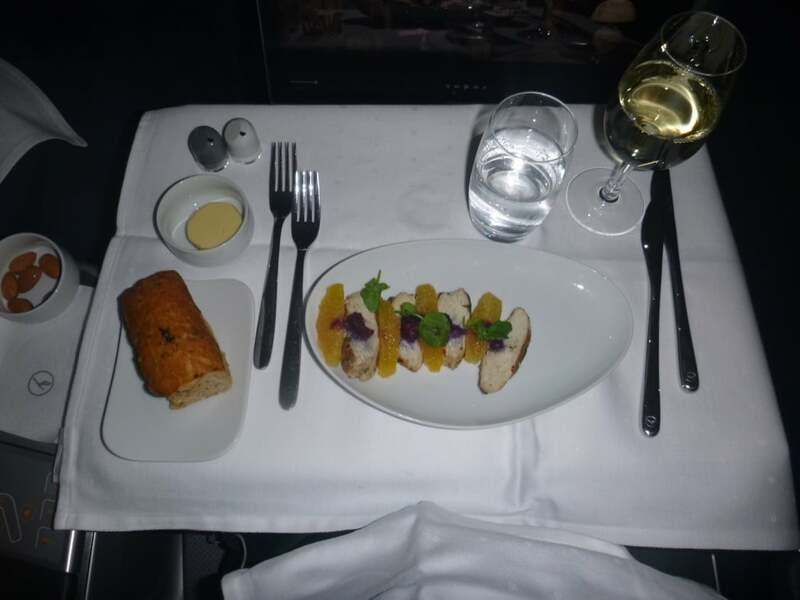 You may be interested in my airline comparisons including Business Class on United Vs Delta Vs American Airlines, top 10 Best Business Class airlines for long haul travel and the best airlines to travel to Europe in Business Class. This review was written by our friends at Driven2Travel.